During study we constantly work with information. And very often we need the printer, the scanner or the copier. 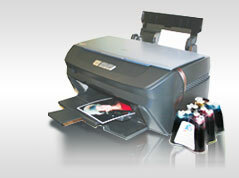 With CISS your expenses for each print decrease by 20-30 times! • Cost of color printing of one page (А4 format) is only 0,01 cents! • Possibility to learn graphic editors: Corel Draw, Adobe Photoshop and to check results by printing at home! • Possibility to receive additional earnings from other students: printing of black-and-white, color text, color copies, photos, etc. … and many other things that you can do with color printer equipped with CISS.